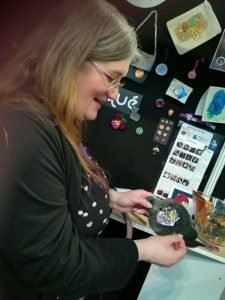 This time last month I was getting ready for my trip to Birmingham in the UK for a big trade show for the creative craft industry called CHSI Stitches. This was the third time I’d visited the three day show and for the second time I met up with my good friend Christine from Scrapbook Getaways and we went to the show together. 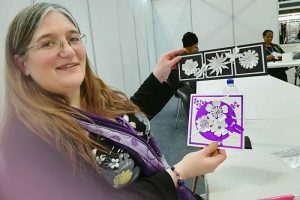 There was a wide variety of businesses exhibiting across many genres of crafting including paper crafts, fabric crafts, yarn crafts, multi media and art and whilst we concentrated on the card making and paper craft companies it was nice to see some new things as well. Sadly this year there was a distinct lack of jewellery making products but luckily we already have some fabulous suppliers that we will continue to work with for the foreseeable future, some of which we actually met at previous Stitches shows. One stand I was really looking forward to seeing was Galactic Plastic and I certainly wasn’t disappointed. This unique material has so many uses, primarily for me it was jewellery that first came to my mind although it can be used for card making and mixed media projects also. It must have felt like ages for poor Christine waiting for me while I was having fun playing with this fabulous medium. 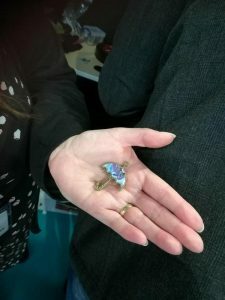 I got some excellent tuition and made an umbrella pendant I’m really proud of, what do you think? Of course it had to be shades of purple! 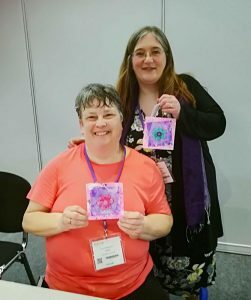 As well as all the fabulous new suppliers and products to see there were also seminars and workshops which we both attended. The main seminar for many of us this year was on the new GDPR regulations that come into effect on the 25th May, we were all feverishly taking notes to ensure we comply with all the new data protection guidelines. We have already taken steps to make sure we are totally up to scratch and you will see some further updates from us soon with regards to your protection. With all the data protection changes happening now is the perfect time for us to update the handmade site to bring it up to date with this one our craft supplies site, whilst we’ve been doing this for a while now it is within days of completion. Rather than just have samples and details of our bespoke card making, wedding stationery and jewellery making service, we want you to be able to purchase ready made products as well. It will take a little while to upload all the items as you can imagine but once the main framework of the site is done we’ll be well on our way. learning lots of new techniques that I will share with you in future posts. plus a fascinating bit of paper folding with Trimcraft. and something totally different for us diamond painting! Watch this space for more news on that. One highlight for me was meeting a company called Pixelhobby UK who I had previously chatted to on the phone and I am ecstatically happy to be able to announce that Downland Crafts will be the first official stockist of Pixelhobby UK products in Ireland. I can’t wait to show them to you and to have another play myself, I’m just waiting for the stock to come in so watch this space for updates. 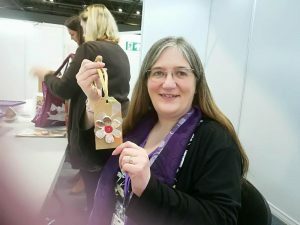 There’ll be lots of new card making craft products as well that we found at the show coming to Downland Crafts very soon, so make sure to sign up for our newsletter to keep up to date with all the latest products, news and special offers. 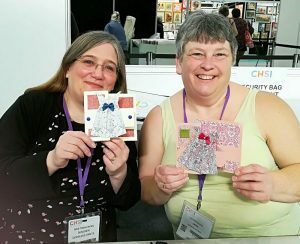 Thanks Christine for making it a great trip, I’m already looking forward to CHSI Stitches 2019!